There are arguably nicer things in life than getting a speeding ticket. To help you avoid getting one, Sygic GPS Navigation alerts you whenever you are at risk of getting caught by a speed camera. Sygic GPS Navigation contains the location of thousands of mobile and fixed speed cameras. 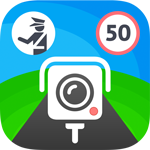 Just drive with the app turned on and you’ll be warned when a speed camera or a police radar appears on the road ahead of you. Up-to-the-minute information from the world's largest online speed camera database will help you to be safer on the road and avoid costly tickets. Our robust Speed Camera database is updated on a daily basis. It consists of more than 60 000 fixed speed cameras, red light cameras and average speed checks all over the world. On top of that, the community reports tens of thousands of additional mobile speed cameras and police checks every day. The Speed Cameras feature is available for free in the Sygic GPS Navigation app for iPhone, Android and Windows. Please note that you’ll need internet connection to get the mobile speed cameras warnings.